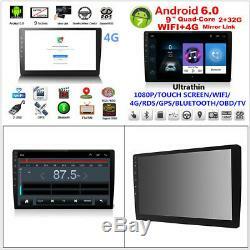 Android 6.0 Double 2Din 1080P Touch Screen Quad-Core Car Stereo Radio GPS Wifi 4G BT DAB Mirror Link OBD. 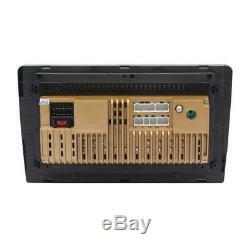 Built-in Head Unit or Memory Card. Music /Radio/Blueeoth/DVD/IPOD/IPHONE Can/Working Same Time While GPS Working. 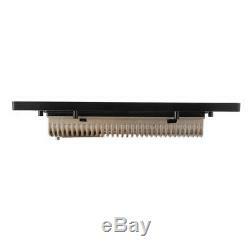 High Hardness, Scrape Prevent, 5 Point Touch. Support Different Storage File Copy and Movement. Basic is about 5 S, Most is about 25S. Support Android App Install, Delet. Support On-line Weather Forcast and Lived Wallpaper. Screen Type: Digital Capacitive Touchscreen. Support Angry Bird, Cut Apple. 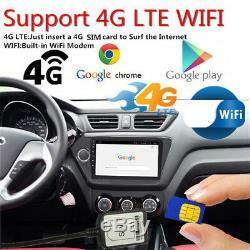 With an external USB type 4G dongle , just put your 4G SIM card in it , you can access the internet in more places. One Channe AUX Video Input One Channe Rear Camera Vidio Input. 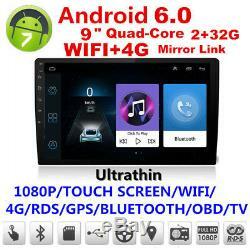 Bluetooth Reveive Parking Information, like motor change speed, Oil consumption (developing). Chinese, English, Russian, Spanish, Sveska, Turkish, Slovencina, France, Dutch, Ceaky, Italy, Portuguese. GPS Language is Depened on the GPS Map Software Program. Power Supply: DC 12V (allowance range: 10.8-14.5V) - Max. 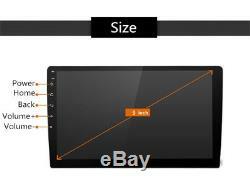 Current: 10A - Screen Size: 9 inch - Front panel Size: 229mm(Top width)130mm(High)219mm(Bottom width). Operation System: Android 6.0. CPU: Quad Core CPU Processor 1.5GHz. RAM: 2GB - Extended SD Card: Support TF Card up to 32GB. 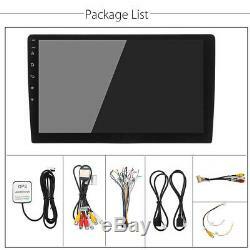 Touch Screen: Yes - Resolution: 1024600 - Capacitive or Resistance Screen: Capacitive - Built-in Clock and Calendar: Yes, show real time and can use network-provided time - Main Menu Status Bar display: Can be changed to Music/Radio/BT-Stereo Player and Clock/Date/Week - Change Apps-Icon Position: Yes. Connector: On the Back - WiFi: Built-in WiFi Modem, support 802.11b/g/n - With an external USB type 4G dongle , just put your 4G SIM card in it , you can access the internet in more places. Explorer: Opera, UCWeb, SkyFile, Dolphin and more explorer for your selection - Online Entertainment: Online Video, TV, Movie, Music, Radio, Video Chat - Online Navigation: Online Google Maps Navigating - Online Games: Yes, online play or you can download it from google play store - Online Communication: WeChat, Twitter, Facebook, Skype, Gmail, Whatsapp etc. Read and edit Office Software: Yes, support Word, Excel, Powerpoint, PDF, TXT. Could play via song list - Record: MP3, WMA - Other: LRC synchronized display; ID3 search; Search by files; Album Picture; User-defined audio effect - Audio IC: Top Global Cirrus IC, independent audio decoding - SNR: Noise rations:=90dB. 264, DIVX, XVID, RM, RMVB, MKV H. ASF, TS, TP, 3GP, MPG etc. =30 formats, Playing internet video directly (while downloading) - Play: Up to 19201080 Pixels, 30Mb. Fluent play without light spot. Operation System: Android 6.0 - Support Maps: IGO, Sygic, Google Map etc. Voice Guidance: Yes - Support 2D/3D Map Views: Yes - Dual Zone: Yes, navigating while music playing - Online Navi: Yes, support google maps online navigating. Hands Free: Yes - A2DP (Bluetooth Stereo Music): Yes, can play stereo music through Bluetooth - Bluetooth Music Control: Yes, play/pause/previous/next - PB-Download: Yes, can download phonebook from mobile to this unit - PB-Search: Yes, can use the first letter to search contact member in PB-Listings - Calling Records: Yes, Dialed Call, Received Call, Missed Call. Setup: Auto Answer, Auto connect, Device name. Built-in Microphone: Yes, on the front panel. 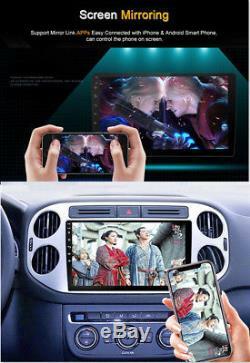 Position: 2 USB Port, can be connected with Media/Camera/DAB+ Box/Smartphone - Play MP5 Videos: Yes, can play RMVB Videos up to 1080P - Touch Music Title to play directly: Yes. 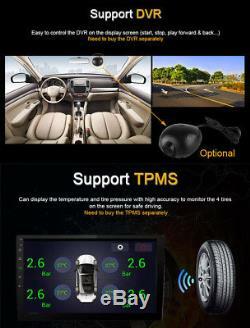 Built-in Car Recorder App: Yes, just connect a USB Camera to use this function - Support HD CCD Camera: Yes - Play recorded Video directly: Yes - Storing Position: Nand Flash/GPS Card/SD Card/USB Storage can be changed. Textbook: Could change font, font color, background color, bookmark, reading E-book while listening music - Photo Viewer: Support JPS, BMP, PNG, GIF etc. WiFi/Hotspot/Bluetooth: Yes - Brightness level adjustable: Yes - Wallpaper: Wallpapers/Live Wallpapers/Gallery - Sound: Key Tone & Volume - Storage: Display Internal Storage/Nand Flash/Connected Device Storage - Apps: Running Apps display/force stop/uninstall - Security: Yes - Accounts: Yes - Languages and Input: more than 70 Languages and choose input method - Backup and Reset: Yes - Date and Time: Setting Date&Time by yourself or choose GPS/network-provided time - Accessibility: Yes - GPS: Yes, GPS application options/monitoring/sound mode/mixing ratio - Driving safety: Watching Video, Reversing X-mirror/Volume, Reversing Trajectory/radar Display, Rear view ruler - Amplifier: Rock/Pop/Jazz/Classic/Flat/Voice/Custom - Steering Wheel Control: Yes - About Device: Display Parameter Info. 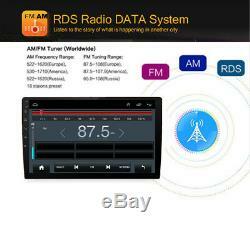 AUX Video In - Rear-View Camera Video In: One - AUX Audio In: R/L - DTV Box In - DAB+ Box In - Car DVR In - GPS Antenna In. Video Out - Audio Out: LF, LR, RR, RF - Surround Stereo Out: 450W - Subwoofer Out. 1 x Car MP5 -1 x GPS Cable. 2 x USB Cable -1 x Power Cable. 1 x 4G SIM Card Cable. 1 x Camera Input Cable. All items will be checked before packing. All items are new and of high quality. We will reply you within 24- 48 hours. 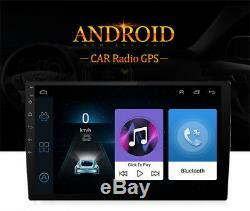 The item "Car 9'' HD Stereo Radio Navigation Mirror Link Android 6.0 Head Unit 2G+32G MP5" is in sale since Thursday, September 6, 2018. This item is in the category "Vehicle Parts & Accessories\Car Parts\Interior Parts & Furnishings\Other Interior Parts & Trim". The seller is "jqoi4770" and is located in CN. This item can be shipped worldwide.